Augmented Reality (AR) is all about viewing the real world in an enhanced way. The literal definition is a version of reality augmented by a computing device. A device can be your iPhone, webcam, any mobile device with a camera or even glasses with computing power. The idea is pretty simple at its core; but its ramifications for the future are far reaching. As you view the real world, augmented reality can replace what you see and/or add data to what you are viewing.Take a look at the future. 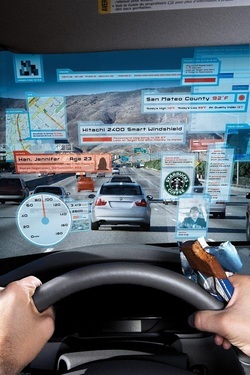 Imagine you are wearing your heads up display contacts and this is what you wake up to: a world where everywhere you look, everyone you look at and everything you see has information and data floating near it, over it, or hiding things you don’t want to see. From landscaping visualization to virtual signage to new ways of gaming in the real world. AR is the next wave of the internet. We can put pieces of our technology to play in your product – for example one of our partners uses our vector tech in their AR search application, another uses our indoor tech in an industrial application and another is implementing our AR chat. We can bring your 3D assets into the real world. We can write your augmented reality mobile and social games. We can do full face or full body model overlay like the transformers augmented reality app. We can create facial recognition apps that can change your face or augment the view with accessories – even take away blemishes! We can create retail applications like Virtual clothes and jewelry shopping and try on and interactive kiosks. We can write any custom AR application you can dream up on mobile, mac and pc platforms. We can make content products like AR magazines and books. Bottom line is if it is augmented reality then come to the experts that don’t just do gimmicks. We engineer applications.